We're committed to providing the highest quality products at the best prices. If you find a lower price for an identical item at a competitor's store and large chain retail stores, we'll gladly match it. Just bring in the original print or digital advertisement to a sales associate at the time of your purchase. The competitor price must be offered on the same date as the date of your purchase. Price match is eligible only on the day you make your purchase. The item must be the identical item, brand name, size, weight, color, quantity and model number. It must be in stock at the time of Price Match. Online competitor matches are limited to items sold and fulfilled by large chain equestrian retailers that are based in the US. 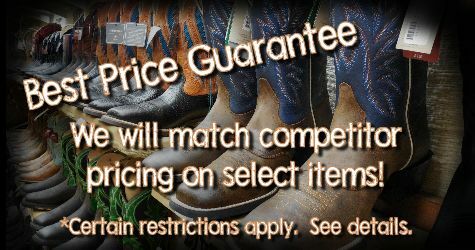 Online competitor prices that are matched are base price plus shipping if applicable. Please bring the entire printed ad, or show the online price or digital version of ad on your mobile device for proof of price. No rain checks will be issued for items that are out of stock. We do not price match competitors if they are out of stock. We reserve the right to limit quantities of price matches per identical item per customer for local and/or online competitor matches. Items that are Price matched are not eligible for any additional discounts, coupons, or offers on top of the Price Match. Items that are Clearance, closeout, liquidation sales, damaged, used, open package, refurbished, pre-owned, storewide or unspecific offers, non-branded items, or prices that only display on a website after guests log in are not included in our Best Price Guarantee. Pricing or typographical errors, gift card offers, sales tax promotions, free items, and rebates or mail-in offers are not included. “Marketplace” prices and prices from third party sellers will not be honored. Amazon.com prices are considered on a per item basis and must be sold and fulfilled by Amazon and not a third party seller.